A screenshot of the website Al Araby Al-Jadeed, a pan-Arab newspaper that had its West Bank office closed by the Palestinian administration this week. The Palestinian administration in the occupied West Bank shut down the local office of a pan-Arab newspaper this week after accusing it of "offensive" reporting on Palestinian security coordination with Israel, officials said. As Palestinian-Israeli street violence surged last month, Al Araby Al-Jadeed daily accused the administration of jailing "dozens of (Palestinian) political prisoners on charges of resisting (the Israeli) occupation". The newspaper, which publishes a broadsheet in London, Beirut and Doha, also alleged torture within Palestinian jails. It branded the closure as politically motivated. Such domestic scrutiny is touchy for U.S.-backed Palestinian President Mahmoud Abbas, whose forces have quietly helped Israel curb violence in the West Bank while he publicly condemns Israeli crackdowns and policies regarding a contested Jerusalem shrine. The Palestinian administration closed Al Araby Al-Jadeed's Ramallah bureau on Tuesday "as it lacked a license to operate," Deputy Information Minister Mahmoud Khalifa told Reuters. An Oct. 20 letter from the Information Ministry to the attorney-general, a copy of which was seen by Reuters, said the newspaper had published a report that was "offensive to the State of Palestine and its security services." 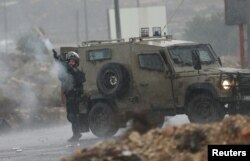 An Israeli border police officer fires tear a gas canister during clashes with Palestinian protesters near the Jewish settlement of Bet El, near the West Bank city of Ramallah, Nov. 5, 2015. The report "made it look as if the security services have no job except to make arrests and to carry out security (coordination with Israel) which in itself an incitement against the authority," the letter said. Naela Khalil, head of Al-Araby Al-Jadeed in the West Bank, described the bureau's lack of a license as a pretext for the closure, which, she said, the Palestinian journalists union was trying to reverse. Failing that, she said, the newspaper will appeal the decision at the Palestinian high court of justice. "The closure of the office is politically motivated and it has to do with the freedom of expression," Khalil told Reuters. "We applied for a license more than a year ago, provided all necessary documents and started our work, and we had received no notification from the Information Ministry about any legal problem with the license," she said. "The Information Ministry said they were some reports we wrote that they did not like." The U.S. consulate in Jerusalem, which handles Washington's contacts with the Palestinian administration, said it was looking into the matter. The State Department's "2014 Country Reports on Human Rights Practices" found that while Palestinian laws provided for freedom of expression and did not forbid criticizing the administration, these "do not specifically provide for freedom of press". The U.S. report cited cases of Palestinian security forces arresting journalists deemed critical of the administration and restricting media coverage deemed sympathetic of Abbas's Islamist Hamas rivals, who control Gaza.